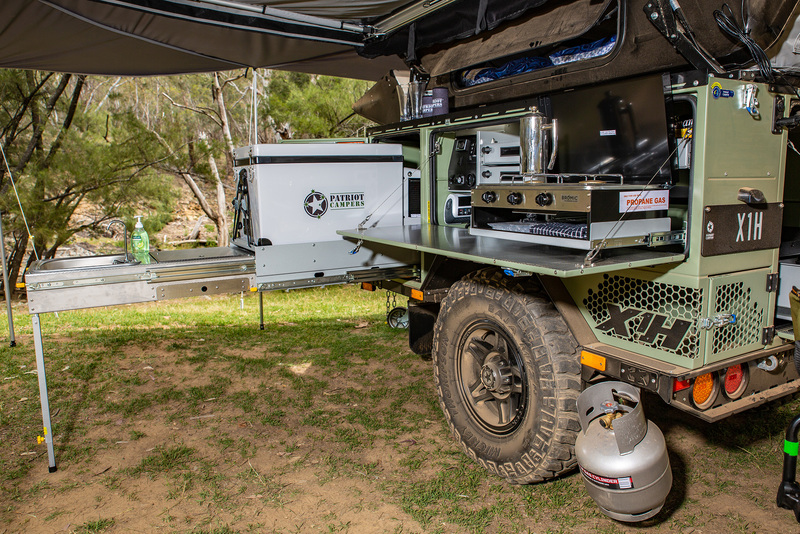 Designed with painstaking precision in Patriot’s manufacturing quarters, the X1-H looked truly at home by the rocky escarpments and gumtree-lined creek beds of Mudgee. All judges agree, there are some fronts on which Patriot cannot be rivalled. They say the X1-H manages to be both trailblazing and traditional, introducing various innovations whilst also sticking to Patriot’s effective, established fundamentals. Where do you start with the Patriot X1-H, or rather, where do you finish? 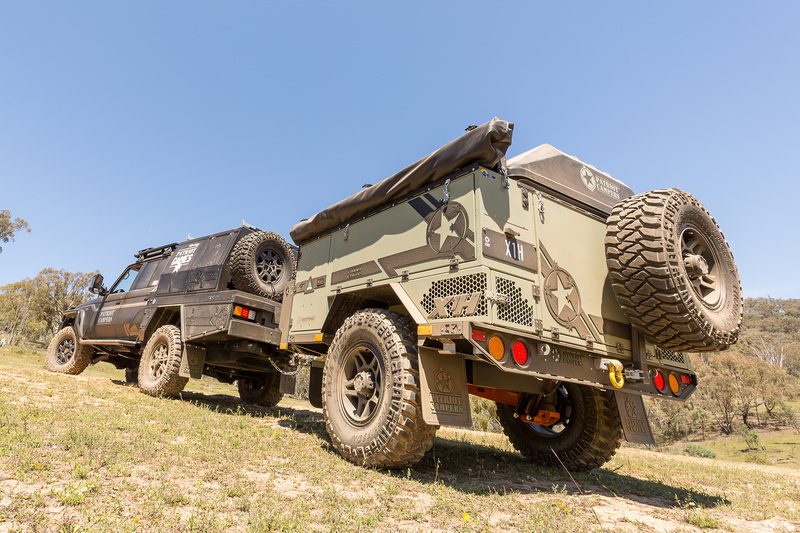 This camper continues to evolve into ever new directions, all the while sustaining a standard of engineering and finish that is second to none. As a five-time winner at CTOTY, it came to this year’s shootout with a big reputation to defend. This year’s version, with the addition of the ‘H’ onto the model designation, continued the focus on the rooftop accommodation, with the H standing for hardtop. Press a remote button and the fibreglass top tilts up to an auto stop (there is a manual override). Then pull out the tent, and fold-over floor – and suddenly you have sleeping accommodation. The power storage has been upgraded to two 135Ah gel batteries, backed up optionally by the award-winning Redvision system, paired with a REDARC 30A battery management system. This is top of the line stuff in the power game, with its 30A charging capacity across DC-DC, solar and AC systems. Tied in with an optional 1000W REDARC pure sine wave inverter, it sure makes for a pretty secure system. The 130W fixed solar panel on the hardtop would probably find it hard to keep up with the demands of all this, but should input sufficiently to keep it within bounds, until you had the Anderson plug hooked up again or extra solar blankets out. The wiring harness has been redesigned to allow for plug and play model cross-over for Australian, US and European markets. The water capacity is 155L in two tanks (85L and 70L) that now automatically switch over from one to the other, and heating comes from the new model Webasto diesel unit, which is quieter and provides space heating into the top tent. Gas capacity is now at two 4.5L bottles mounted in front corner pockets, with a handy hook at the rear to hang a bottle if you need one back there. The Patriot X1-H? Still top of the game. There’s no time to take a breath in the life of Patriot Campers. Just when we thought it couldn’t get any better, they’ve done it again, presenting the all-new Patriot X1-H with a multitude of design changes from their multi-award winning range. Patriot have developed strong relationships with the biggest and best component manufacturers in the business, such as Cruisemaster – and when it comes to suspension systems, the name Cruisemaster stands alone. 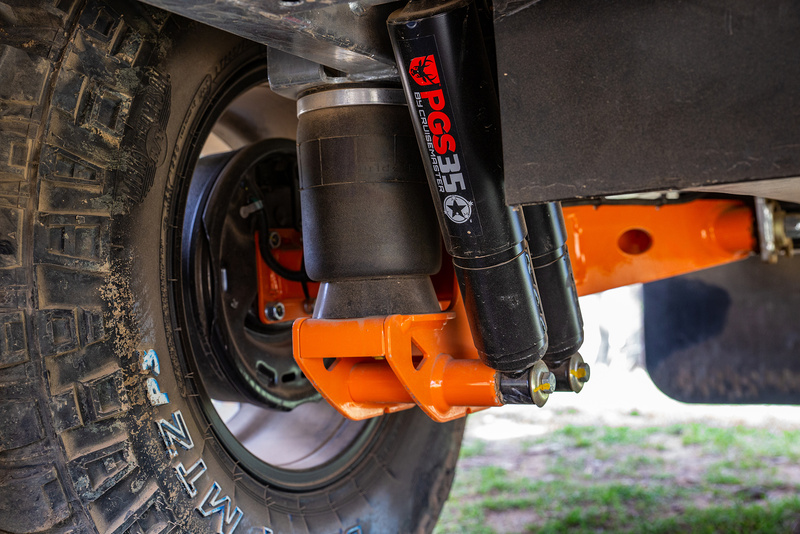 The partnership has developed the all new X-Cruise suspension, made exclusively for the extremely low Tare weights of the compact Patriot X1 camper. The new suspension fits somewhere in between the premium Cruisemaster XT and ATX and has been seriously road and track tested before its inclusion. Our demonstration unit showed off its rolling sleeve air bags and dual PGS35 shock absorbers in a superb display. Every possible component of the suspension is manufactured in house by Cruisemaster for maximised quality control, with the consistency and accuracy of robot laser cut technology. 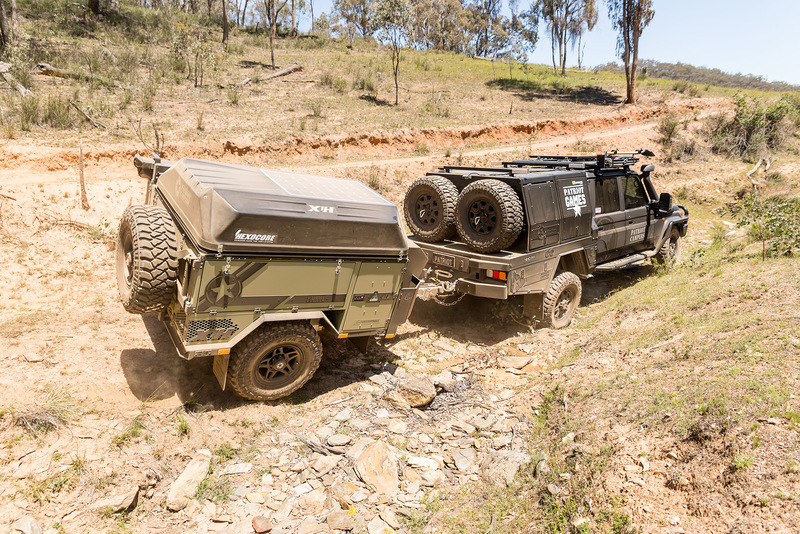 Yet, Patriot have taken their X1-H one step further, by refining the time and track proven chassis to create an even stronger, yet lighter weight offering, with even more features and serviceability. Their commitment to detail doesn’t stop there. Take, for example, the new PCOR 16” alloy rims, a deep dish spoked design that is specifically made to match the Patriot star logo, fitted with Mickey Thompson Baja MTZ P3 tyres, when only the best will do! Out in front of the A-frame drawbar is the classic Patriot interchangeable extension and it’s fitted with the strength, ease and reliability of the cast and forged Generation Three DO35 offroad coupling, also from Cruisemaster. 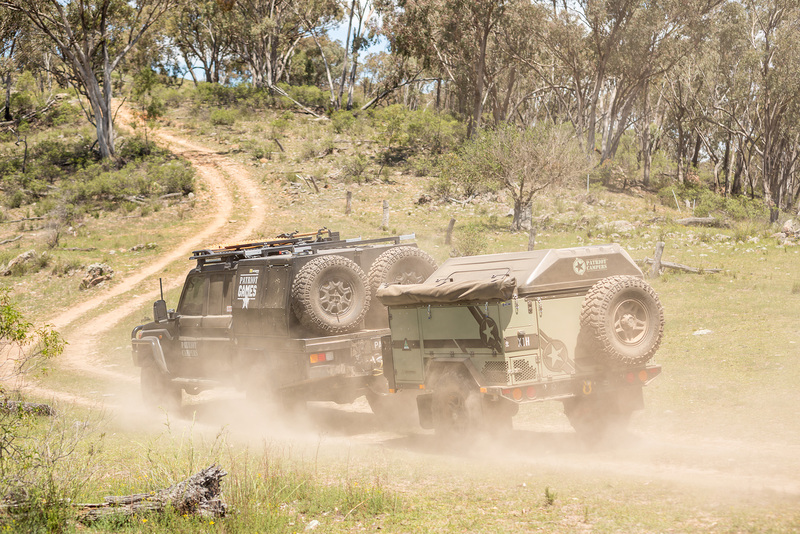 Patriot’s winning combination of tried and trusted manufacturing and componentry ensure they will continue to lead the way in the worldwide camper trailer market. 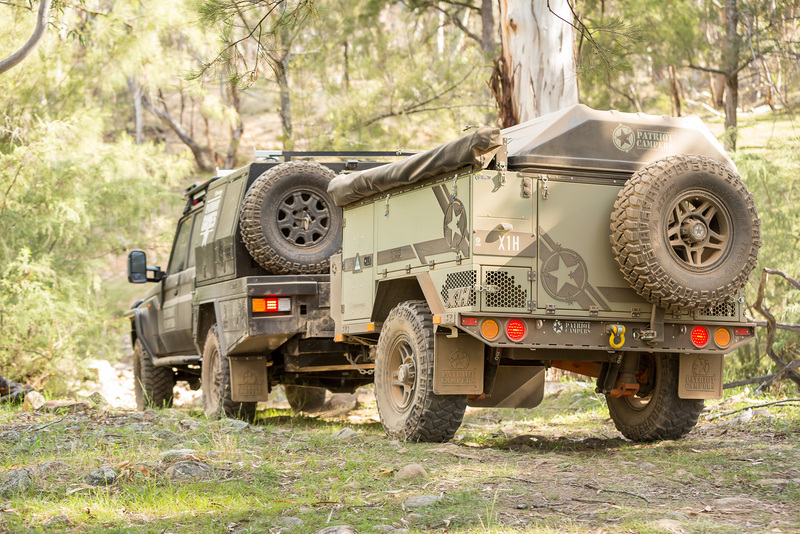 Patriot have a reputation for high-quality, true offroad campers with a healthy splash of Aussie ingenuity. The brand new X1-H is very much true to this ethos. We arrived at the Patriot camp right on setup and watched the whole thing unfold through its myriad stages. 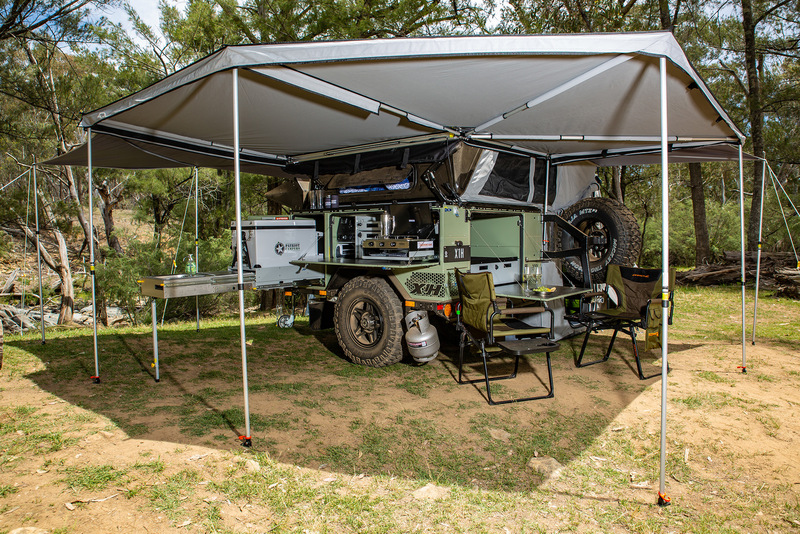 It’s conveniently engineered for versatility, with three setup options (rooftop tent only, an added change room with walls and floor, and an optional single-pole kids’ room) to adapt to your length of stay and the size of your cohort. It’s a simple and straightforward process that kicks off with a click of the remote control button (with a manual override, just in case). The X1-H is just as well suited to a family as it is to a couple, or a couple of mates. And looking at the page of updates Patriot’s Justin Montesalvo put in front of the judges, this latest model shows continuing innovation and evolution of design. 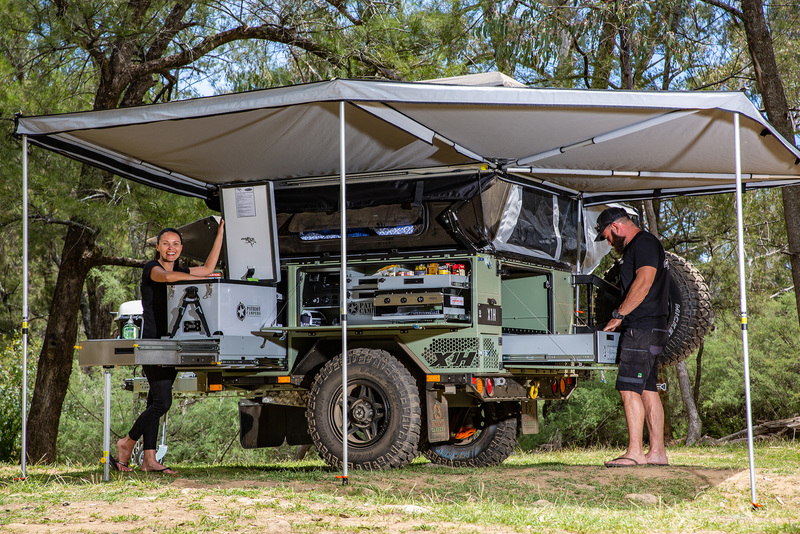 The new Hexocore hardtop lid on the camper’s roof increases ease of use and longevity, and has a built-in 130W solar panel; the improvements to the tent’s moulded plastic access ladder have lifted this invention into the realms of a ‘staircase’ (try finding a sturdier ladder on a camper); and inside the tent is a redesigned bed hinge with a slimline design, integrated lighting around the bed base and Patriot’s own exceptionally comfortable, gel-top pocket spring mattress with condensation matting underneath. And that’s just the beginning of the list of updates, all designed to improve manufacturing efficiencies and resulting in a more user-friendly end product. The model we viewed was $58,000 with options, but the $52,990 base price will open the X1-H to a broader market – the idea being to bring the camper back to basics, as standard, to stay competitive in a sea of imported campers. Top marks for a quality, functional and fit-for-purpose tourer. How do you make a fold-out rooftop tent better? Give it to Patriot and let their design team rebuild it. Enter the Hexocore Hard Top Integrated Tent, like no other before it! 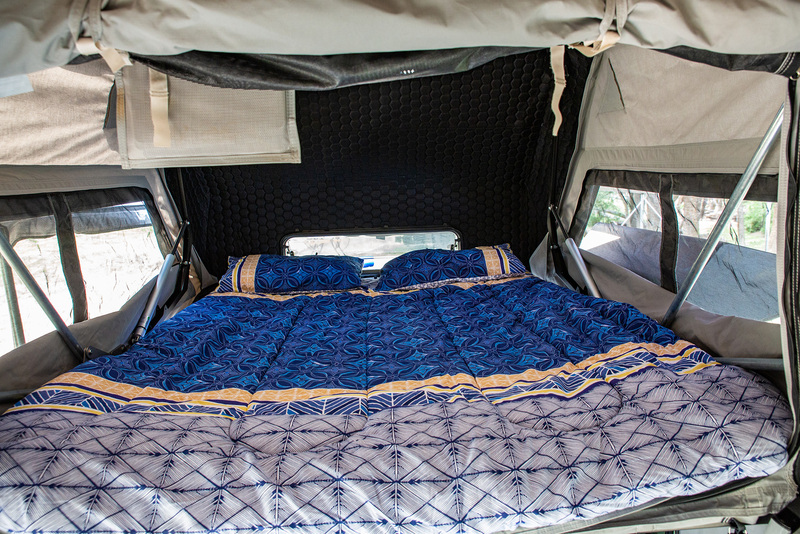 Inside this tent section the hardtop roof features a hex pattern roof lining that helps insulate the sleeping area, where you’ll find a new gel-top, pocket-spring, super-comfy mattress. Built-in wall lighting and other accessories are controlled by a bluetooth connected smartphone, while a window at bed level allows you to order and take your favourite coffee from the cook in the kitchen area! If you opt for the optional diesel water heater, you’ll also get ducted heating into the tent area of this well-considered camper. This mightn’t be so important for us Aussies, but with Patriot’s continual expansion into the US and European markets, some form of heating will prove a godsend. There are also dozens of other little and not-so-little changes, like the redesigned chassis that makes the whole trailer not only lighter but also tougher and easier to use; and like the all-new TentStep that gives access to the sleeping quarters. This TentStep is an absolute cracker and one of the best I’ve seen. 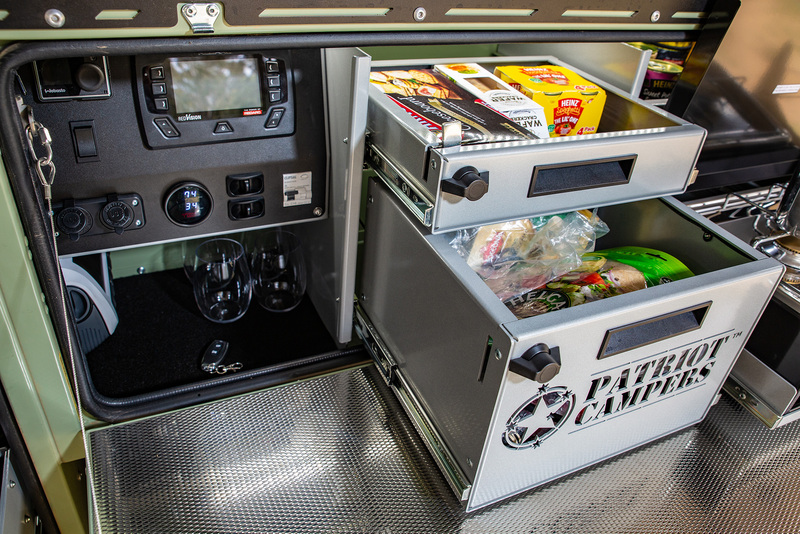 Of course, you also get the normal well-thought-out kitchen, storage, electronic, gas and water setups we’ve become used to with Patriot. So, even though you mightn’t expect a seemingly basic camper in the expedition style would have much new or exciting to look at, that’s exactly where Patriot have excelled. Go-anywhere capability, no-nonsense looks and exceptional build quality combine to make the X1-H cream of the crop and the envy of all to look at. No other manufacturer in the last 10 years has set such a record of innovation, and followed that up with good design and fine manufacturing.